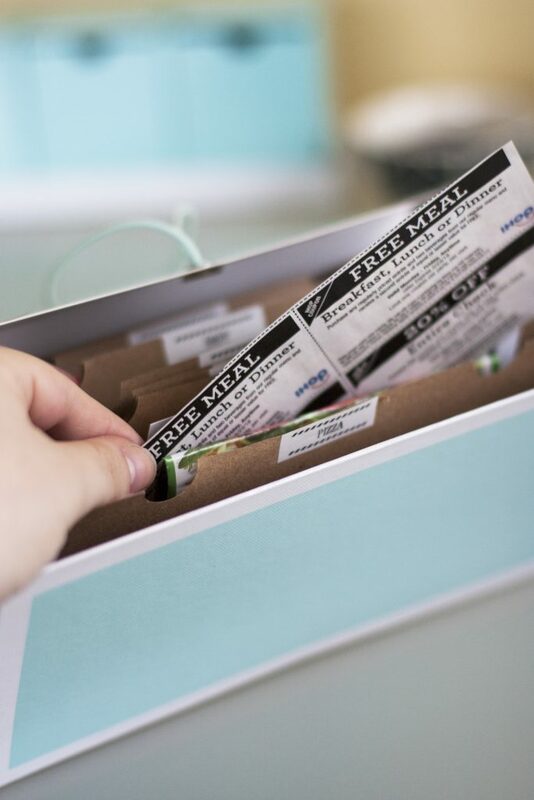 Where do you keep your coupon stash? I would venture to guess you have coupons somewhere, and most people I know have no method for organizing them. They usually pile up on the kitchen counter or are shoved in a drawer. The funny thing about coupons is that even if you bother to save them, you probably often forget about them until they’ve expired. I’ve never figured out how to organize coupons very effectively in the past, but I found a solution that’s working marvelously! I organized our mess of coupons in less than 15 minutes and it’s a simple system that I know will work for us long term. No more coupons floating around the house because I don’t know where to put them! Let me show you what I did! 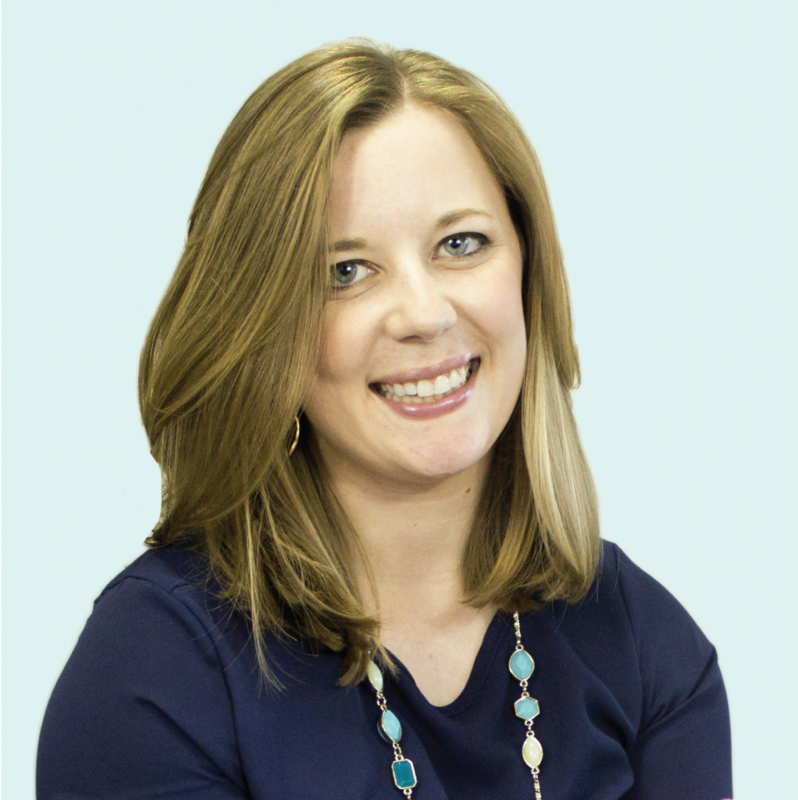 You may have seen those crazy blog posts with fancy binders overflowing with alphabetized coupons, but that’s definitely not me. We don’t use coupons very frequently, and many of the coupons we do use are digital. Out of all the coupons we get in the mail, I usually only save a few. 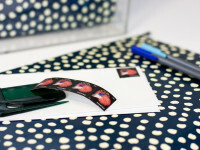 I’m very selective about the coupons I save – they have to be for things we’re likely to buy before the expiration date. The coupons I keep are usually for pizza, restaurants and toiletries. I can clip digital coupons from our grocery store and load on my loyalty card, so I rarely save coupons for food anymore. Holding onto a paper coupon for a few cents off a can of corn and having to remember to take it to the store and give it to the cashier is just not worth it to me. While I may not have a large stash of coupons, I still need a way to organize what I have. 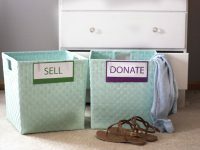 One of the biggest organizing lessons I’ve learned is the importance of giving everything a home. 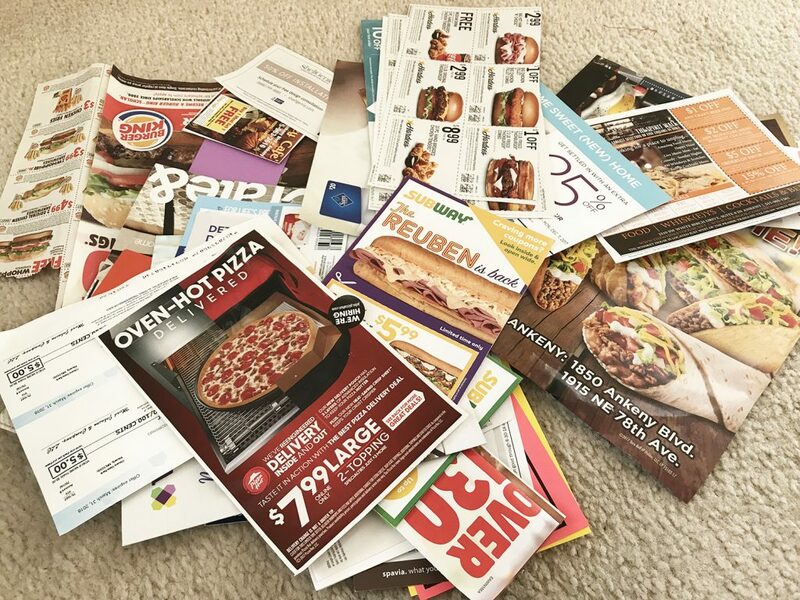 If your coupons don’t have a designated spot, they will pile up and become clutter. 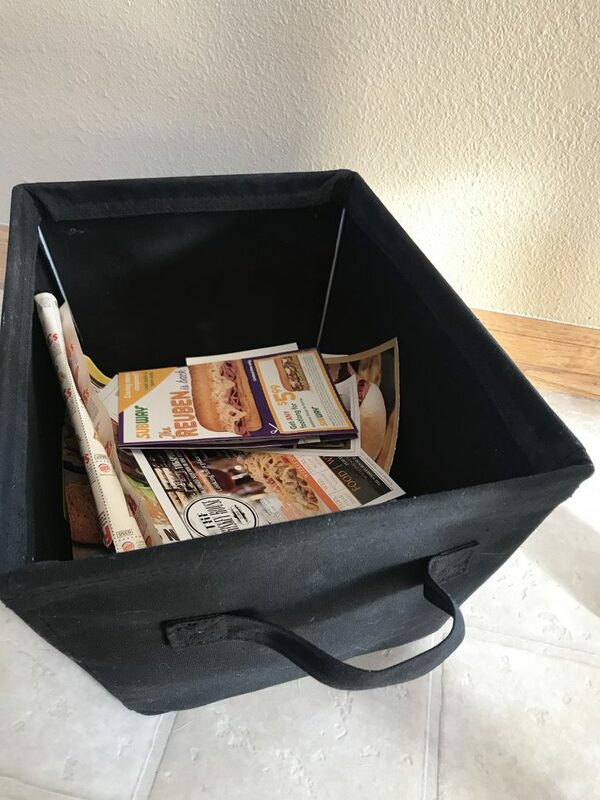 Since we moved four months ago, our coupons have lived in this random bin. 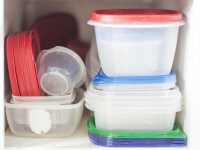 Not because it was a great place to store them, but simply because that was the container closest to me the day I decided I needed a spot for all the coupons that were piling up. Well, one day I finally got fed up with the sea of coupons I had accumulated in this bin and decided to organize them for good. I first sorted through them all and found that a large majority had expired. I sorted the rest of the coupons into categories. One tip I have is to cut out coupons with scissors. I used to get in a hurry and try to rip them out of the weekly shopper, but I never failed to tear part of the coupon and the jagged edges made everything messy. Now I keep scissors stashed in my mail organizer and in our kitchen so they are always handy when I need them. 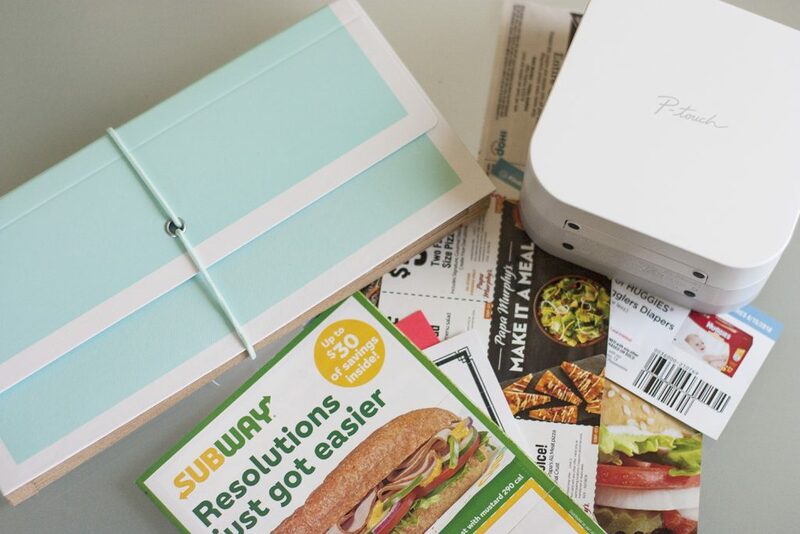 A small accordion file is perfect for coupons. You can usually find these at the dollar store or in any office supply section. Here are some cute-but-cheap ones I found online. Label each section of your accordion file with a category of coupon. These categories are completely up to you – really think about what type of coupons you use personally and create categories accordingly. 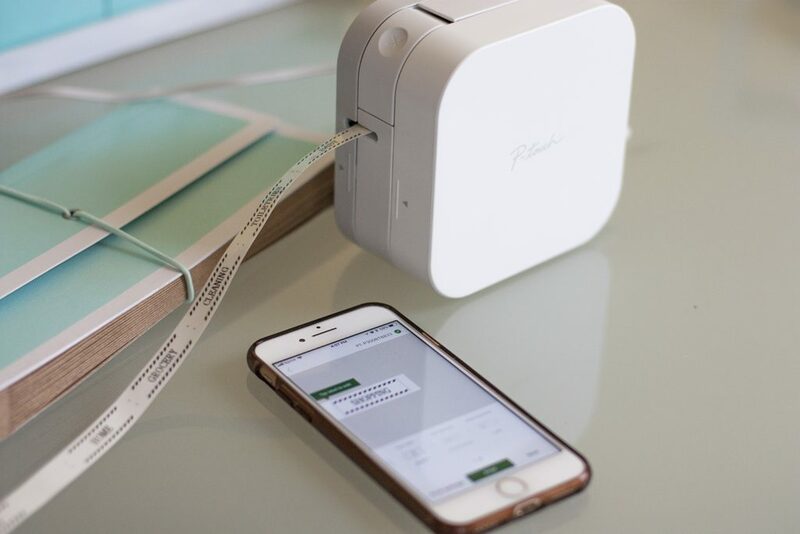 You can handwrite your labels, print them out on label paper or use a label maker. This was the perfect project to test out the new label maker I got for Christmas! 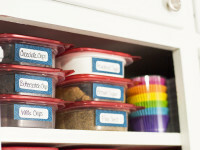 I’m alreeady obsessed with it because I can choose from all kinds of fonts and designs in the app and then connect to the label maker via bluetooth. I created these labels in just a couple minutes! The last step is an easy one – simply tuck your coupons in the appropriate sections of your file! In addition to coupons, you could also organize gift cards and loyalty cards in the same file. That way you have them all in one convenient place for the next time you are out shopping. For example, it makes a lot of sense to keep my Kohl’s charge card, coupons and gift cards in one place. I love the small size of this coupon file because it fits in a desk drawer or in my mail organizer. It’s also small enough to throw in my purse when I’m running errands. 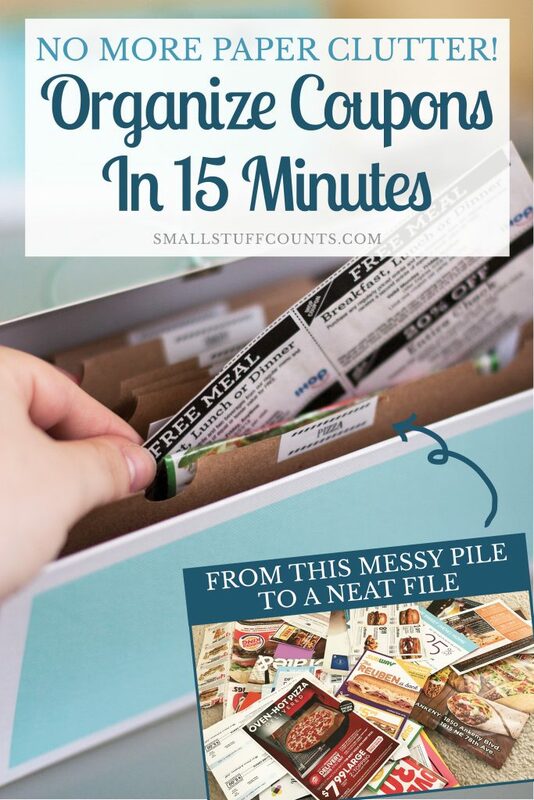 If you’ve ever wondered how to organize coupons so they stop taking over your kitchen counter, this is such an easy project. 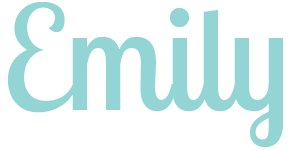 And the title of this blog post is no joke – the whole project literally took me less than 15 minutes including sorting through my mess of coupons and printed out the labels. Easy, peasy. How do you organize your coupons? Let me know in the comments below!